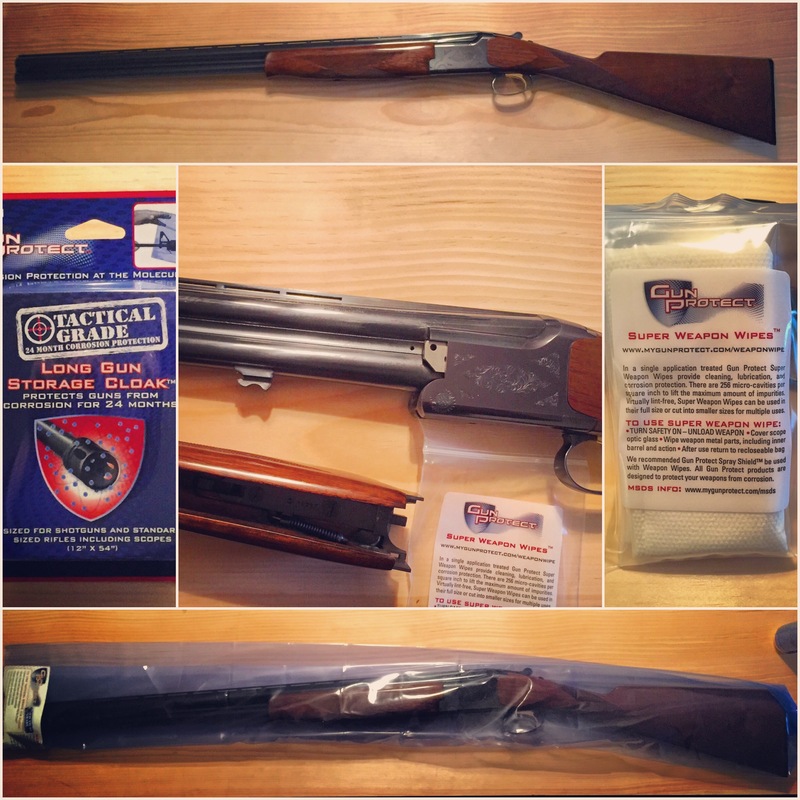 Gun Protect cleaning, lubrication and protection. 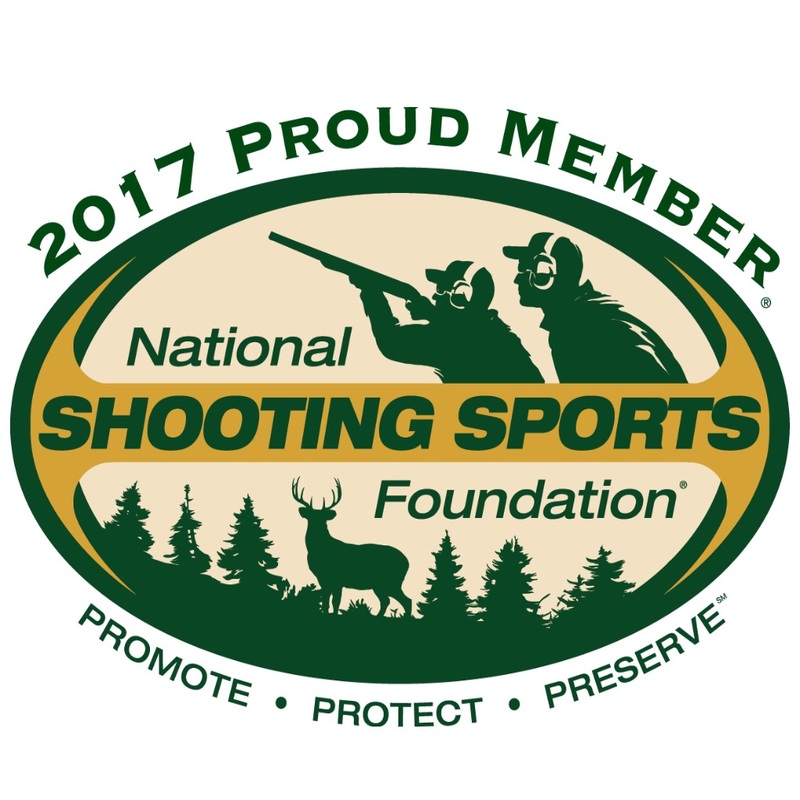 When I first spoke with the folks at Gun Protect I learned of the products’ evolution. It seems the folks behind the product were in the Air Force for many years and involved in shipping of armaments. What they noticed was incoming shipments of everything from parts to tanks were sealed inside plastic bags. Upon investigation, it was discovered that the bags were part of a system of corrosion protection. 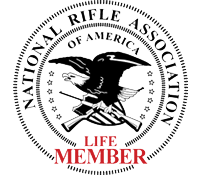 That system was recreated and marketed to the public as Gun Protect. The bags work in combination with a protective spray to supply the best protection against corrosion for long or short term storage. 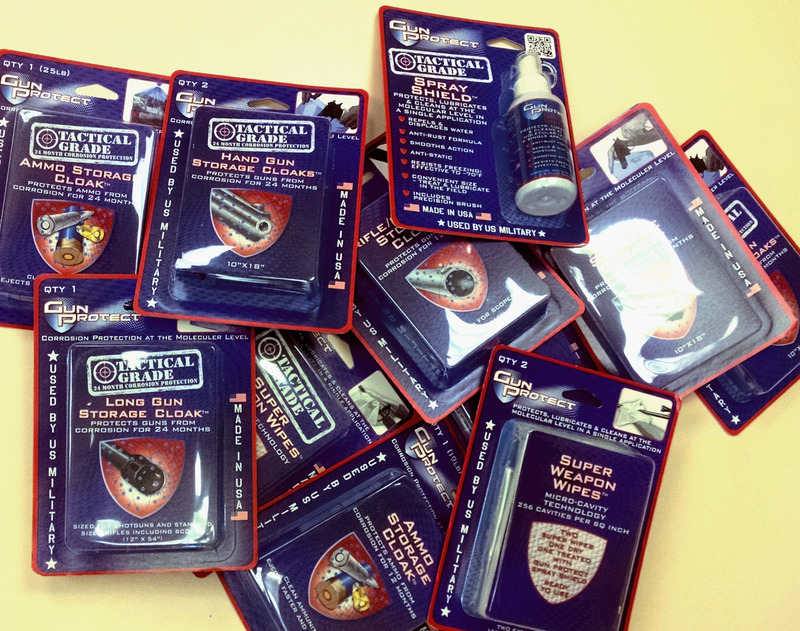 The Spray Shield product goes on (inside and out) the firearm or other object you want protected. Spray Shield then bonds to the metal as a barrier that repels moisture and keeps the weapon protected. Spray Shield also acts as a lubricant that will keep your action smooth without fear of over lubrication. (In my experience, it’s thin enough to keep things running without collecting enough gunk to jam you up on the range.) As for the spray shield alone, I can say it performs better than most of the brands on the market in preventing rust. I used it 8 months ago on a metal lid that was in a moist chemical environment and it stopped the existing corrosion completely with only one application. On the range, it keeps everything running smoothly and it certainly is better than the top selling oil on the market (one you may REMember as being backed by a large firearm company). When used with the Gun Cloak product the protection is something I would not question. It’s probably the best thing going for any safe queen you may have. For myself that meant landing my Browning Citori in this system without a second thought. Many of us have used silicone gun socks for this purpose for years but they are porous and I’ve worn plenty of holes in them. The Cloak is far superior. I wouldn’t be afraid to bury a weapon in a treated cloak but would laugh at the idea in a gun sock. 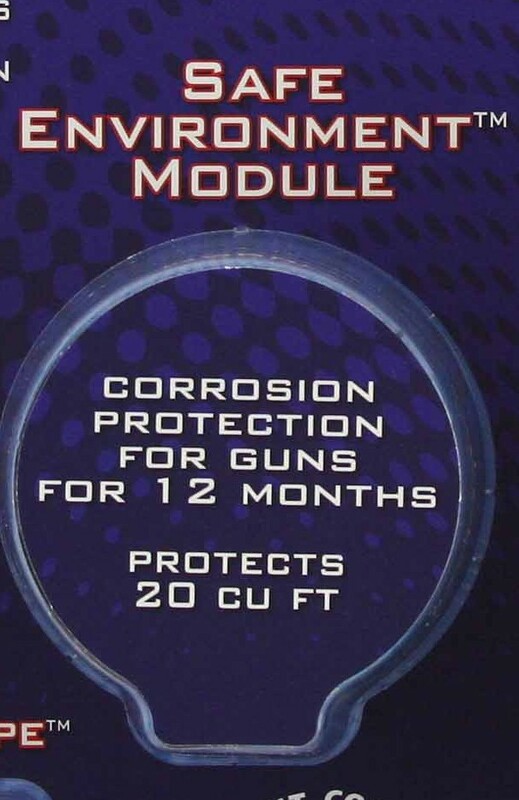 Other reasons you may want to consider the Gun Cloak/Spay Shield combo; for those that don’t have a good safe, are you aware that the foam in most gun cases can collect moisture from the air and hold it against your stored weapon? The same can be said of the foam inside some of those old nylon holsters. Another great use would be your truck gun. Many people keep a rifle in the truck, whether for immediate need when riding the fields and checking fences or maybe it’s survival prep. That gun sits neglected behind or under a seat. A Gun Cloak would give you years more service from that weapon. But wait, there’s more. 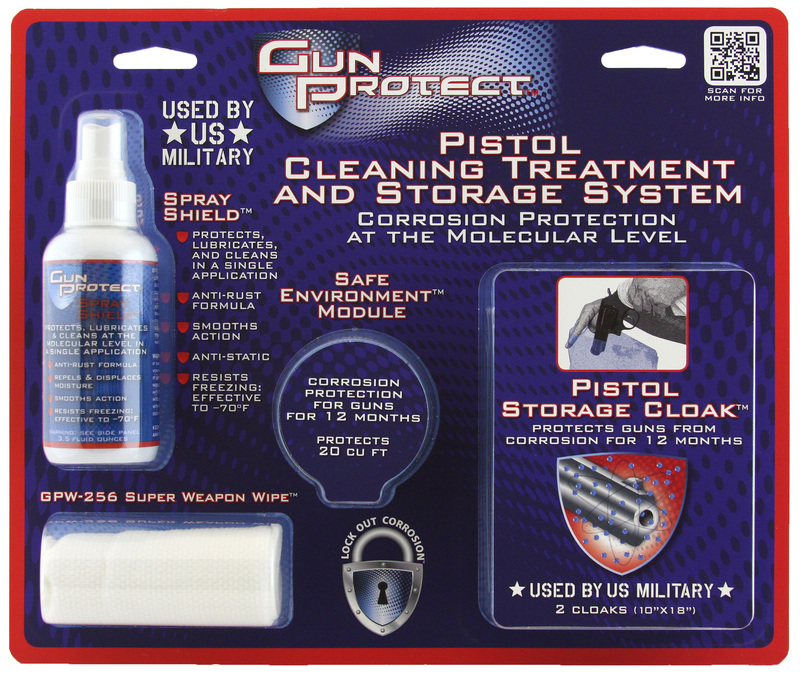 Gun protect offers a Safe Environment Module to keep the humidity out of your gun safe for 12 months. All you have to do is open the package and tuck the disc somewhere in your safe and you can forget about moisture in the air for the coming year. On top of that they offer wipes and pistol sized cloaks. Plus much of this gear is available in tactical grade to stretch its performance out to 2 years. I was quite pleased with these products and use them often. While I admit, I switch back and forth often I find myself using spray shield a lot for the convenience, knowing I will get good service without worrying about heating the metal after application. It’s all good stuff that I would recommend to anyone. 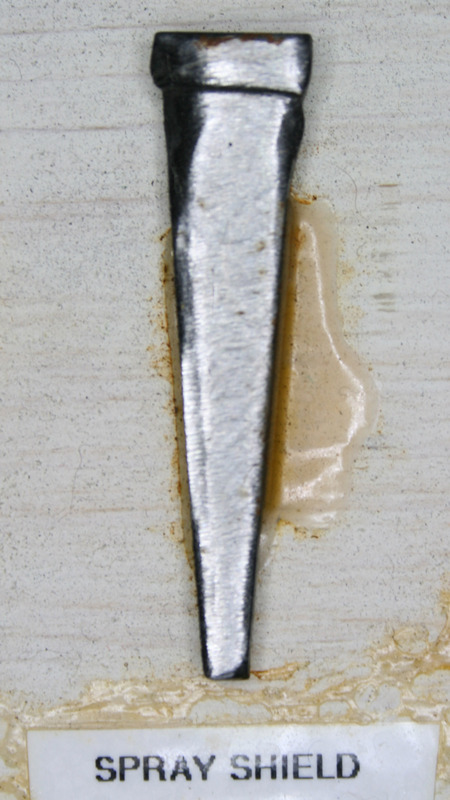 After 10 days of spraying this nail with water, Spray Shield has kept it pristine. 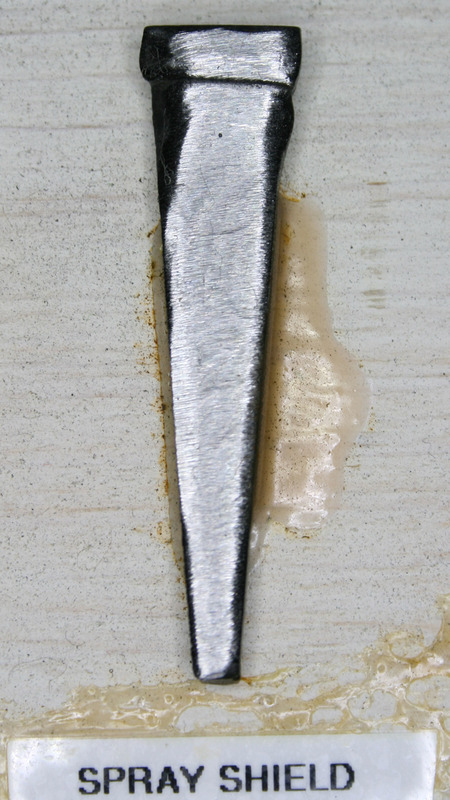 Treated on day one with Spray Shield this is the same nail after 27 days of spraying with tap water. It took less than an hour to see Gun Protect Spray Shield was protecting the steel wool on the left.